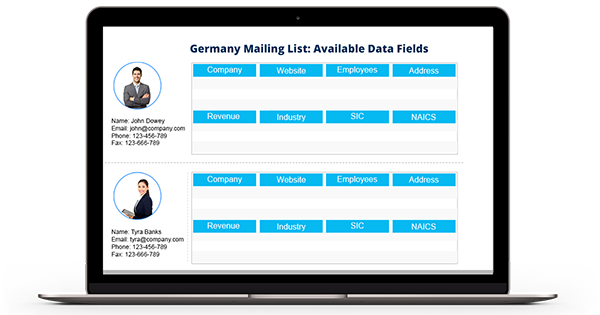 Get Customized Germany Email List, Germany Mailing List, and German Telemarketing list to reach your targeted Companies and decision makers in Germany through multi-channel marketing campaigns. Germany is the largest market in the whole of Europe. Availability of best-in-class infrastructure and a positive business ecosystem attracts marketers from all over the world to explore business opportunities in Germany. If you too are one of those seeking to extend your offerings in the German market, Blue Mail Media’s Germany Mailing List can be your competitive edge. Our database contains all the relevant marketing information you may need to reach your target audience via different marketing channels such as telephone, email or mail. Our Germany Business Email List can shore up your marketing efforts significantly, and facilitate seamless conversations between you and your B2B customers. Blue Mail Media over the years has established itself as one of the most reliable data providers around the world. Our team invests significant resources in accumulating data from the right sources, checks data quality stringently and updates our database with latest feeds. Our List of German Business Email Database is sure to help you connect with your target audience removing the mediators and junior level executives from the communication chain. Also, we also acknowledge that you may have different marketing needs than others, and so, we offer you customized Mailing List of German Businesses. You can also avail our pre-packaged database. Blue Mail Media has been a prominent name when it comes to delivering marketing data to businesses all over the world. We have a strong data partners network that enables us to serve clients in USA, UK, Canada, Europe, Asia, North America, Australia and other important regions. This also allows us to help our clients in a global way, yet with a local touch. Furthermore, our German Business Executives Database has been designed to help you achieve measurable success in your marketing campaigns. With this database, you may realize a visible increase in your campaign response rate, greater conversion rate, as well as higher ROI.